On the heels of highlighting the Top 10 Mom-Owned Restaurants in America, we’re pleased to bring you a series of interviews with the talented women on the list. 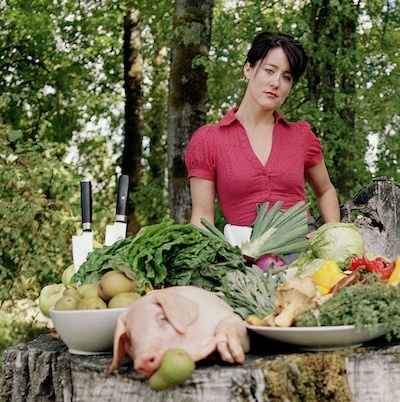 First up is Naomi Pomeroy, the chef-owner of Beast. Beast opened in 2007 and is one of Portland’s most acclaimed restaurants. Not surprisingly, chef Pomeroy took home a well-deserved 2014 James Beard Award for Best Chef. She is mom to daughter, August, who is 13, and, two years ago, she joyfully acquired two step kids, 8 and 6. Which came first for you — motherhood or owning a restaurant? I had August before I opened my first restaurant, but I had already started catering at that point, which can be similarly stressful. I never really had to choose. Did you have any role models who inspired you to pursue both parenthood and culinary entrepreneurship? I remember hearing about Alice Waters raising her daughter, Fanny, around the kitchen at Chez Panisse. I don’t necessarily think that was at the forefront of my thinking. Nowadays, as far as a current role model goes, Suzanne Goin of Lucques and AOC is a huge role model. She and her husband are both in the food industry and have three relatively young children. They’re always doing charity events, and I have no idea how they find the time to balance all that they do! What are some of the biggest challenges you’ve faced in attempting to balance family life and owning a restaurant? I don’t know, but my daughter laughed when she heard that question asked! It was hard for me when August first started going to school, specifically when she was about 5 or 6. She started needing me a little bit more at that time, which coincided with the opening of my first independent project, so the timing was the most difficult part of it all. When your kids are in school, their off-times are your busiest times, so, occasionally, it’s hard to find the time to spend together. That’s specifically why I haven’t worked brunch on Sundays for a long while now, and I’ve established certain times for us to be together. Honestly, I was blessed with having the right kind of kid. She has a great temperament and is happy wherever she is, so it was much easier for me to get the help I needed when it was needed. I think that if I had a different kid who was more demanding, it would have been much more challenging for me. Obviously, as all moms do, I’m sure you’ve experienced guilt and felt pulled in two directions. How did you handle those moments? I wouldn’t be alive without having felt that guilt. I think you realize that when you’re making one choice, you’re choosing to sacrifice one part over another. It’s been a constant battle for me. If I’m not at work, I have to let go of my sense to want to control everything. When I’m not with my daughter, I think about being at the end of my life and wondering if I should’ve spent more time with her. Ultimately, family is so important, and balancing that has been about taking care of her, but also taking care of myself. I don’t think I could’ve done as good of a job parenting if I wasn’t happy and satisfied with my own work life. So even with all of the sacrifices I’ve made, the quality of the time we spend together is wonderful. What are the most rewarding things about motherhood and being such a highly regarded chef-restaurateur? I want to set an example for my own daughter, and, hopefully, for a lot of kids (girls, especially), so that they can see how both work and family life can be balanced. I have a really good relationship with my daughter, and I have a great career. I hope to stand as an example of the idea that you can be both a mother and a career woman. I don’t think you have to choose one over the other, but you have to have all of your ducks in a row to do it right. Your kids can see you doing something you’re passionate about and while you’re also be very devoted to your children at the same time. But it does mean that your socks are never matched! There are a number of successful female chefs and restaurateurs, but far fewer who are also mothers. Why do you think that is? Because it’s hard! I was 25 when my daughter was born, and I had no money or any plans. Nowadays, it feels like as a society, we’re having kids older and older with greater expectations of the idea of perfectionism in parenting. These perceptions put a lot of pressure on mothers, in general, both working and stay-at-home. There are a lot of social obligations, and today’s kids’ lives feel very structured and planned out. Parents are choosing their kids’ preschools during their pregnancies, and that pressure to have your child be advanced is overwhelming. Perfection in parenting is a myth. I try to leave my obsessing over perfection to the food and empower my daughter to be who she is. There seems to be more male chef and restaurateurs who also have families. How do you think the parenting experience might be different for dads? I don’t think it’s really any different. My friends, Gavin Kaysen, Dan Kluger, and Danny Bowen, are all high-profile chefs who work a lot and have young children. And, just like moms who work in this industry, they want to see their kids more than they do and live for the moments in between their shifts where they get to spend time with them. I’m sure they have to find outside care to help them with their children from time to time. But the bottom line is that everybody in this industry is really busy, and we all make sacrifices — we’re always working when other people are playing! But on the upside, it’s not as busy when you go camping on off-days from a Monday to a Wednesday! Is there anything the industry could do a whole to help women achieve success while still having a family? Promote weekday dining? Haha! I think profiling moms and dads in the industry and taking a more honest and open look at what we all sacrifice to do a combination of the two is wonderful — more talking, please. At the Cherry Bombe Jubilee in March, chefs Suzanne Goin and Gabrielle Hamilton both agreed that the best way to try to balance being a chef and a mother is to own the restaurant at which you work. Would you agree? Yes, because when you own the restaurant, you aren’t working for someone else and you can write the schedule. You can say, “My daughter has a ballet performance, so I’m not going to be at work tonight.” I can’t imagine the horror of asking for sick days, trying to take my child to the dentist, seeing what’s acceptable and what’s not, and not feeling encouraged to take care of my daughter. Are there any ways in which owning and running a restaurant can help inform your role as a parent — or vice versa? I had August before I went into the restaurant industry, but I was prepared for motherhood by having siblings who were 13 years younger than me. I actually think that part of my natural tendency to being nurturing to others even before I was a boss is reflected in my leadership style. I treat the kitchen and the staff much more as units of a family than as just employees. I imagine you’ve developed a healthy support system at home and at your restaurant. I think the most interesting time was when I first opened Beast. I was a single mom at the time and working 90-100 hours per week. August was 6 or 7, and I didn’t have enough money to pay for a nanny yet, but my landlord at Beast, who was also a friend, lived in the building next door. In order to help me get Beast off of the ground and running, she offered to watch over August in the meantime. I would pry my sleeping child off of the couch after work, carry her down to the car, put her to bed, and take her to school the next day. It really did take a village at that point. I also had someone who did prep for me, whose brother also happened to be a cab driver. He would pick her up from school and bring her to Beast on Wednesdays when it was too hard for me to get to her. Now, I think with really fortunate timing, Beast is almost 7 years old and has a really great crew of people, which has allowed me to invest time in my daughter, now 13, when she needs me most! Do you have any moms working for you at Beast, and has being a mom helped you work to accommodate their needs? I think the fact that I started my businesses while being a mom has enabled me to have a much greater understanding. I only have one employee currently working for me now who is a mother. She actually began working for me a couple years ago and became pregnant during that time. She worked throughout her pregnancy, left to be with her daughter, and is now back working part-time! I was really excited that she wanted to come back to work, so I offered her whichever hours she’d like dependent upon both her husband’s needs and childcare availability. Is the notion of balance a bunch of bull? Balance is a pipe dream no matter who you are! Nobody balances. There are a lot of careers you could go into where you could achieve a greater balance, but then again, my friends who are lawyers work even more than my friends who are chefs. Do you have any advice — philosophical or practical — for women who aspire to own a restaurant and have a family? I didn’t get into this business to own a restaurant. I wasn’t trying to get anywhere in particular. I got into this business because I was passionate and wanted to work really, really hard. It should be about the process and the journey that you’re on, and if you end up with the right alchemy, you might also end up with a restaurant or a child or both. I’m not trying to sound uninspiring, but I think our society can sometimes be freakishly goal oriented, and the means should be just as much of an integral part of the overall process as the end results are. Neither part of motherhood nor of chefdom is as glamorous as they can sometimes appear. You simply have to be prepared to put in the hours.